656 results. Displaying results 81 - 100. 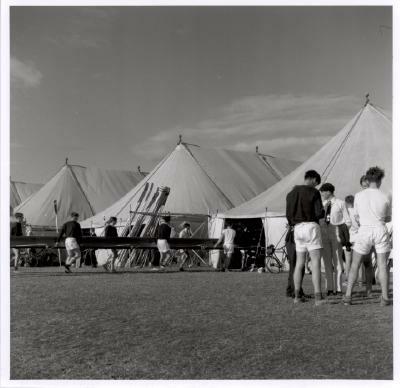 A black and white photograph of boat tents at the Henley Royal Regatta. A black and white photograph with a white border, showing boat tents with crews busily moving boats, at the Henley Royal Regatta. A crew is stood to the right, another is moving a boat in a tent with oars propped up beside them. A black and white photograph of the Hoopla Game at the Henley Royal Regatta Fair. 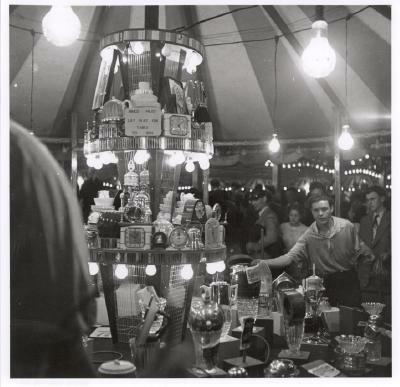 A black and white photograph with a white border, showing the Hoopla Game stall in a side tent. A man is throwing rings at prizes which are lit up with light bulbs and decorated with mirror tiles. 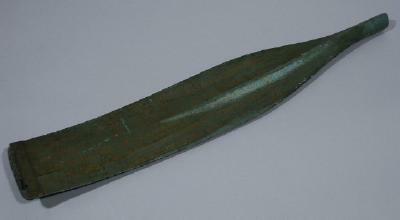 An illuminated oar spoon, commemorating the Henley Ladies Plate from 1885. 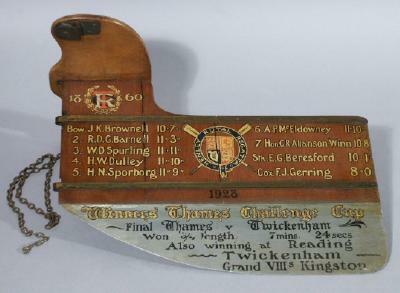 Commemorative rudder for the Henley Royal Regatta Thames Challenge Cup, won by Thames Rowing Club against Twickenham in 1928. The Henley Royal Regatta Since 1839. 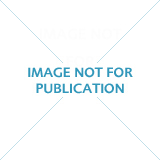 A pictorial review of the Regatta with text by G H J Tomalin. 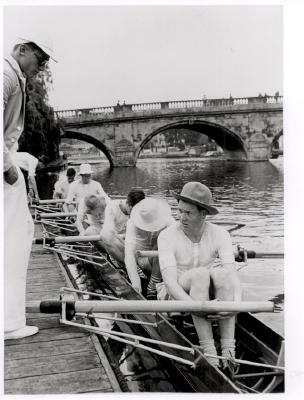 Copy photograph of the Eton crew of eight in a boat beside Leander landing stage, when they won the Ladies Plate at Henley Royal Regatta c1940. 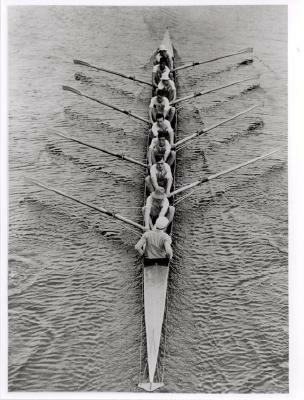 Copy photograph of the Eton crew of eight on the Thames when they won the Ladies Plate at Henley Royal Regatta c1940. 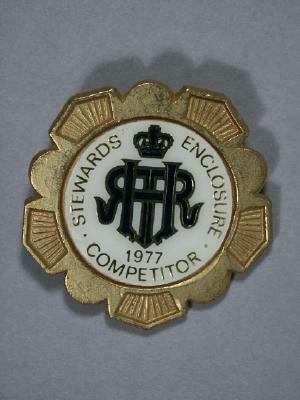 A Henley Royal Regatta Stewards Enclosure badge from 1977. Photograph album containing black and white photographs of Oxford University crews 1910-1930. Includes photographs of Queens College crews, University Boat Race crews, Henley Royal Regatta crews,Torpids and Trial Eights crews. Also includes a photograph of Queens' College Barge.